My fascination and love of sewing began very early in my life. I first learned to sew from my grandmother; she gave me my first sewing machine. My grandmother made hats and clothing and sold them at church. I was born and raised in Washington D.C., and in 1964 my family moved to Seat Pleasant, Maryland. My friend, Linda Carter, and I would hand sew Barbie clothes, hats and accessories for hours. I attended Maryland Park Junior High and Central High School in Capitol Heights, Maryland, graduating in June 1970. Sewing was a mandatory requirement for female students at that time. Starting with seventh Grade, sewing classes were scheduled for the entire year, unlike today’s school schedule (tell what today’s school schedule is like, some states may still have sewing classes). In 8th grade, cooking class was mandatory and then in the 9th grade sewing class was an option. I was very interested in continuing taking sewing lessons in high school, so I selected sewing classes as an option through the eleventh grade. At that time, students were introduced to tailoring and had to make a complete lined suit. 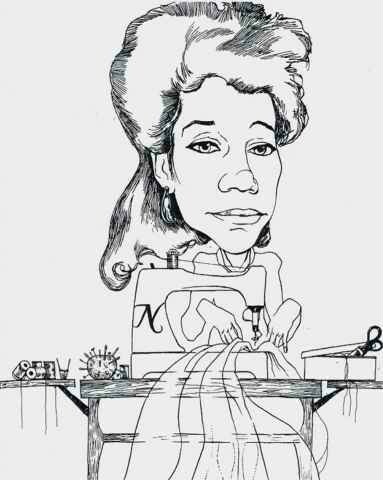 One summer I attended a summer sewing camp at Fairmont Heights High School. The county also provided fabric for two outfits and at the end of the summer and we staged a fashion show modeling the outfits we made. After High School I continued sewing and tailoring courses. Since then I’ve taken numerous sewing, interior design and doll-making classes. I’ve always admired the beautiful artwork of quilting, so about 15 years ago I began taking classes and joined a quilting guild. As a member of a the Quilting Guild, I’ve learned many quilting techniques and you meet wonderful and skillful quilters that are always willing to help and share their knowledge with you. We also make and donate blankets and other items to hospitals, the elderly, children’s organizations and other charities. Over the years I’ve become very disappointed with our school system and their budget cuts which discontinued or shortened the sewing curriculum. I believe many young people would be interested in learning “How to Sew” if it was available to them. I feel that children who sew achieve a sense of accomplishment, and it’s nothing more satisfying than creating a project with your own hands. Sewing will provide real life skills and build self-esteem in an individual. I started work for the Federal Government in March of 1974. In 1988 I opened I my own sewing business “Nadine’s Ltd”, offering custom clothing and specializing in lingerie for men, women and children. I never really thought about the day that I would retire. Then I thought, I would open a Fabric Shop to give me something to do and something I loved to do. It took some time to get the doors opened, but I finally opened my own fabric shop, “The Fabric Peddler”, in August 2006 and I retired from the Department of the Navy in September 2007. Running a business is very hard work. About two years ago, I decided to close my shop and take some time off. I want to be able to set my own schedule, create patterns, take classes and travel. Now I will be selling my fabrics, patterns, books and notions at quilt shows and online. A special “Thank You” go out to my Quilt Guild Members from the Uhuru Quilters Guild, Capitol Heights and the Southern Comforters Quilt Guild, Bowie Maryland. I could not have done it without their help and support in so many ways.